A Tonk's Tail... err, Tale...: Epic Red Dot Battle. EPIC. Epic Red Dot Battle. EPIC. Maxwell: Shhh! I'm sneaking up on an unsuspecting Red Dot. Hm, this also works as a nice warm-up lateral stretch for my abs. I'll have to remember that. Faraday (off screen): Maxie! FOCUS! Faraday: Seriouslies, Maxie? You're quoting Karate Kid when the Red Dot is RIGHT THERE? Wait'll I tell Allie. She's so gonna make you turn in your Cat-In-Good-Standing card. I get distracted when the red dot's around too - I mean, it's just a dot, right? It's not like it's a BUG or something. You have such great form, Maxie! We wish Mom could video in the dark as Bailie chases that red dot around the yard in the evenings at high speed for about 5 mins. It's hilarious to watch and she takes it very seriously too like you kitties do. Dude... wax on wax off??? 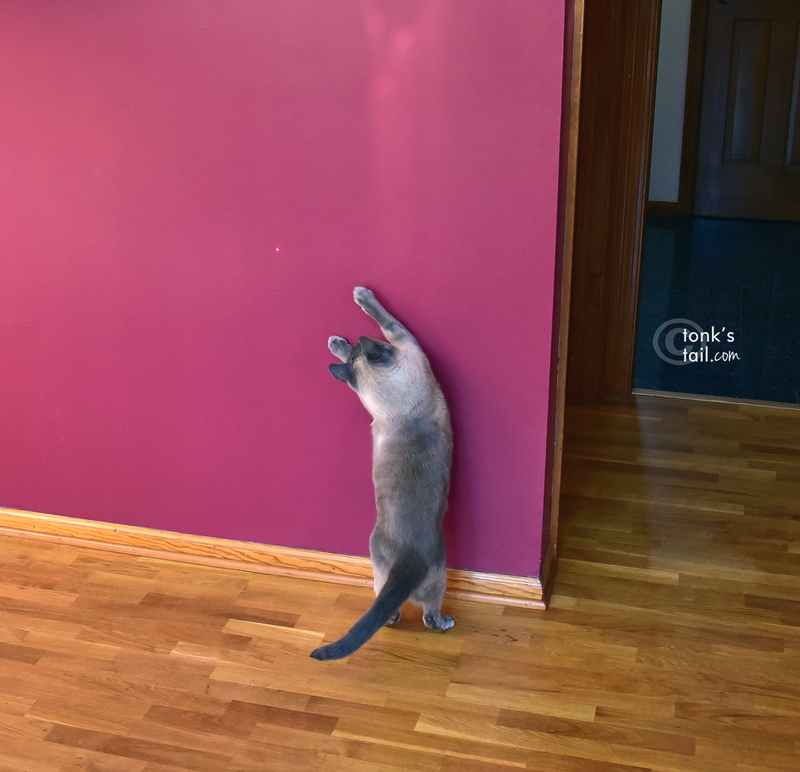 you gotta catch some AIR if you're going to catch the red dot. About 6 inches to the left, Maxie! Keep trying, you will get it. Stretchhhh just a bit more. You can almost reach it. No sudden moves though or it will know it is being watched. Bentley LOVES the red dot game! Pierre simply doesn't get it...at all. That red dot can be an elisive little booger! Hey, love that headr pic!!! So did you ever catch it? 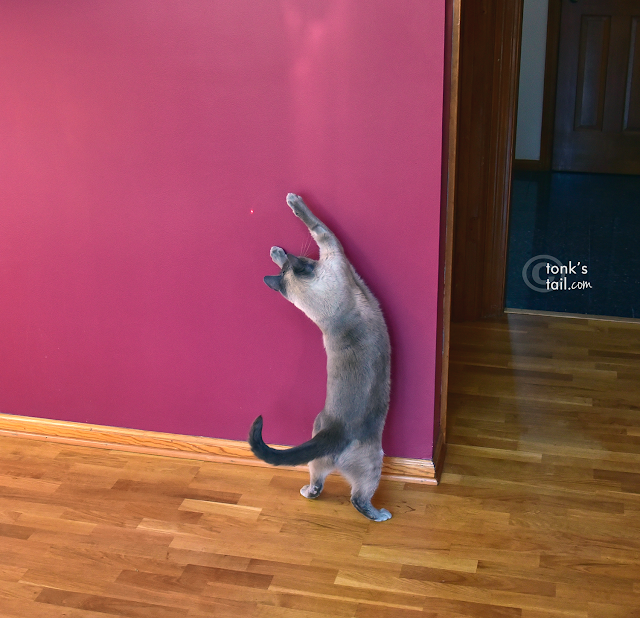 You gotta get that dot, Maxie! Waffles needs to come down and show you how to jump! Bwa! Haa!! Haaa!!! Yous guys really, really knows how to makes mes laughs!!! 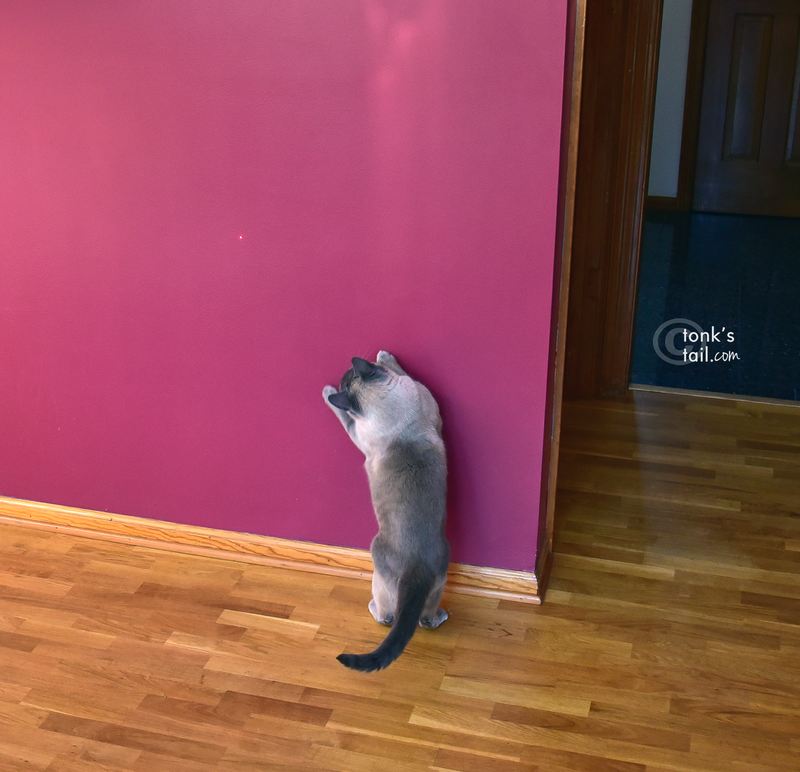 Oh-oh...its the Red Dot!! Grab it, you gotta grab it! Orange you glad it's Thursday?